Our time is abloom with color….as I drive down the streets my eyes leave my purpose and rise to see white, pink, and…yellow? This yellow tree is in front of one of my beloveds’ home. Driving by to give a quick toot hello on the horn, I was stalled by the yellow blooms. I didn’t know trees bloomed yellow. I looked to see if it was paper blooms, put there by a creative crafter. Up close in the late afternoon light, the yellow is subdued into shadow. I think about shadow. I think about how we want to eradicate the shadow within us, seeing it as leftover bad behavior or thoughts. But our shadow is part of our beauty. The yin and yang that brings balance. The light and dark that both bring wisdom. What is your shadow? What stories are told there? What whispers do you give into when the sun goes down and the bright turns dull? Today I got to work with a coach: Robin Olson. We were working with a goofy and eye rolling reality that plagued me this week. It seems that after 3 months of mindfully eating my way into new and fabulous habits (no sugar, reduced wine, no chocolate, less food) I was stunned into excess. And it came on the heals of a fabulous 3 day Qi Gong intensive. Really. 3 days of intensive body/mind/spirit/work and I come home and over the course of the week have a cookie, a cupcake, a glass of wine, shrimp, tons of cheese. I’m not beating myself up. In fact, one of the first thing this fine coach did was affirm and celebrate that I am nipping the backslide in the bud, getting back on track. Yay. Go me. We talked through what I was experiencing. And that is what I really wanted to share with you, my readers. I have old habits. I’m 55 so have had quite a long time to develop various ways of interacting with food and energy. Excess has been a trait of mine for a multitude of reasons, all of which I have faced down and am on the right side of overcoming. Great. So what happened with the Qi Gong intensive that set me back. Qi Gong cultivates energy that flows, and qi gong breathing oxygenates the system. It is a high. It feels great. It is like breathing and utilizing pure energy. I only have 3 months of hard fought practices of eating what serves me and leaving what does not, so I think my system went where it knew best, conditions of plenty and excess as comfort and accommdation. That is the land of no restrictions. I like sugar, wine, coffee, shrimp, cheese and chocolate. Yum. But they are not quality foods that serve me and boy could I tell a difference after having been off them (ok, 80% off of them) for 3 months. What do I need to do now? In addition to the new patterns and new behaviors, I need to create a new mindset. A mindset that redefines what plenty means. A mindset that can taste abundance in quality and in service to my body. A mindset that can navigate the obstacles, like a kayaker in a river of huge rocks, in order to get to the smooth, broad river beyond. So, that is my work for the week. That is what I’m talking about. Obstacles can kill us. But the paddle is going to direct, slow down, speed up, turn around, and guide with expertise my way through to the other side. In this case, the paddle is the Qi Gong forms that I’ve learned and have committed to doing for 100 days. Doing them in the morning allows a built in guide to focus my day and choices. 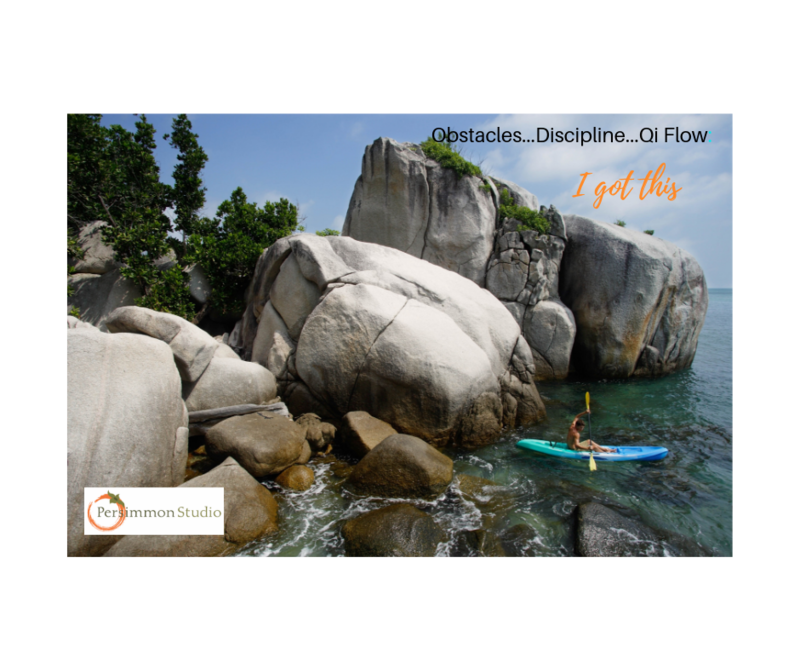 Obstacles, discipline, and Qi flow inevitably arrives at health. I’m pretty confident that I’ll do pretty well. I’ll also fail a bit. But I don’t expect to die. So, there is that. My facebook experience is a highly curated one. It is made up of friends and family and by and large there is a shared sense of values and perspectives. There is also a huge bouquet of spiritual memes that float before me as I scroll. On purpose. I love leaving this social media platform with a sense of depth rather than angered perturbance. Love rather than division. Us rather than other. I like all the memes. Even the ones that I have grown beyond. Also the ones I have yet to grow into. And including the ones that are not on my path of resources but I honor because they are needed by someone for sometime. What I do notice is that the advise and insight is right on. But the how is lacking. How do we live with ease? How do we walk away from toxic relationships? How do we find our inner strength? How do we claim our best self? I’m interested: what flits through your mind when you see a meme calling you to relax, renew, rediscover? What is tickled inside of you when you come across advise to see as a bird sees? Are you startled? Upset? Dismayed? Inspired? Defeated? Cynical? What….what is going on inside of you when you are invited into the deeper realm of you? This (Ah, you knew I would get here eventually) is what spiritual direction offers. Those of us who accompany with expertise in listening and witnessing create space for you to express all the shame, cynicism, disbelief, hope, timidity, courage that transpires as you face yourself off. So, simply put, step into a session and find what you’ve been looking for. You. I had a dream last night: I'm in my honda crv, driving down a rural highway in the middle of the night and feel the vehicle lose power, I look down to see that I've let the gas go to empty. I'm shocked and turn to tell Kurt. He is not with me. I'm alone. I pull over at a crossroads. There are 3 signs for towns north, east, west, all are 2 - 2.5 miles away. I calm my breath and think "I can walk that easy. I'm ok." An old 1960s era station wagon (teal) passes me and turns east. I ponder all that can happen at night on a rural road all alone. Today, a number of really fabulous people gave insight into symbolism on a facebook thread. From their insight and my own engagement, here is how I am interpreting the dream. There is a nastalgic quality to the dream, going backwards before continuing forwards. I’m going to turn east and following the teal station wagon that guides me with its arrow like fancy fins. This is a temporary side trip, to get what I need to continue the journey forward. Crossroads are a point of choice, and my choices are all good, and easily met with a little effort. I’ll journey in the early watches of the night, those hours best used for sleep, dreams, and wondering. Cars are often like spirit beings in my dreams and I’m initially driving in my current for real Honda CRV. I refer to it as my sanctuary. It is a vehicle for road trips, thinking, creative sermon prep, engagement with angels and spirits. It is out of gas, but not through my negligence, nor lack of self care. I’ve crafted a life where care for self and for others are interwoven. The lack of gas is causing a pause at the crossroad. Our dreams cast a symbolic landscape for dimensional thinking. This may be pointing to something concrete, an actual decision, or a frame of mind as I continue to move in my way of forwarding my progress. I know that the dream touches on vocation and purpose, healing and formation because those are the themes of my life and work. Going back in order to go forward. Not a losing ground, but a reflection and sweet dip into my past that will release my future. Thanks to all the providers of dream insight this day. This morning I worship online, at my favorite spot in a local coffee shop. I am tuned into facebook live and the service provided by The Riverside Church in New York. Rev. Dr. Amy Butler is the pastor. She has invited us into a time of corporate confession. Pastor Amy invites us into responses to her spoken words of humble confession as individuals, a nation, and collectively. A soprano sings into the vast echoing space of the cathedral those words “Lord of mercy. Christ have mercy.” She then raises her hands and the whole cathedral is filled with the voicing of confession. My soul was filled with the confession. I could feel it. Across the miles and airwaves and computer screen. Moved with the deep love that surrounds the whole movement of word, song, and collective voice. And then, we are all forgiven. I don’t think of myself in self negating terms. I don’t take on misery as though I am a lowly worm, lower yet, a microorganism in the dirt. I don’t . I know myself to be a striving human. I see myself as a striving human. My striving is not in vain. It has hand holds all the way up. I have to look up and down and to the sides and I move. Sometimes I’m stuck. Sometimes I’m lifted off the trajectory I’ve been on and whisked to another climbing wall that I must scale in order to continue up the wall that is my own striving. I confess my failure. I confess my weaknesses. I confess when my wounds and assumptions have hurt others. I confess when my ego and arrogance takes me off path and I think I know better than another. That forgiveness is swirling around us at all times. It is tiny dust particles that are being breathed in and out at all times. Like a fragrance. Once in faculty meeting, I was focused on someone speaking and my nose was suddenly filled with the smell of grapefruit. Ah! Instant refreshment. My mind said “Who just opened a bottle of grapefruit essential oil?” But no. It was a grapefruit being opened, split, squirted, eaten. The fragrance of that particular citrus escaped no one. It impacted us all. Forgiveness escapes no one. It impacts us all. Into our cells and marrow. Into our hearts that long to be let loose. Into our minds that overthink what we’ve done wrong. Better is not a friend to perfectionism. Better is a friend to growth. Uncomplicated practice, over and over and over again. the millions of free throws Michael Jordan put skin to hoop, the millions of needles a 15 year expert acupuncturist puts in for a great somatic response toward healing, the millions of meals made by Mom that I would not go hungry. Better: Not the same as yesterday or last year, not what it will be next year, tomorrow. Confession and Forgiveness is the freeing process to be better, to move ahead, to strive toward a worthy development. I’m playing with an idea here. I don’t know yet if it is a single topic or if it is a whole system. Something in me likes systems, but systems without walls or step by step expectations. Maybe you’ll have insight to offer. I’m always thinking about growth: personal, professional, spiritual, emotional. All the growth. It thrills me. My entire orientation is toward growth. And I have a nagging question: How does growth happen? I know that there is organic growth. A day by day unfolding, resigned to what is, and one day we realize we’ve changed, or developed or no longer hold the same beliefs as we once did. Most folks in that category won’t seek out spiritual direction or counseling. It is a Que sera sera way of being. What will be will be. It assumes that by vurtue of growing older, we’ll mature. There are those who carry deep wounds of abandonment, oppression, neglect, identity crushing expectations, violence, and more. And these folks want to change. Now. Most often, these folks will go to therapy. Totally appropriate. Spiritual Direction works well with seekers of new patterns alongside counseling or at the point that the trauma has been named and released and now its about crafting a life from the rubble. Honestly, I just want people to grow and become on their own terms. Compassion entails an inner and outer focus. Inner: We must have compassionate for ourselves for believing lies that have lead to our diminshment, compassion for staying too long, compassion for doing the best we could with what we had, compassion for all that didn’t happen. And more! Outer: We must have compassion for the perpetrator/s. In the Jesus tradition of the Gospels, Jesus guides us toward the hard work of loving our enemies and praying for those who persecute us. This is no spiritual bypass, where we deny bad behavior, or forgive and forget. It is recognizing that harm, meanness, and even criminal behavior has been piled on us. This is hard work, and it is key. We cannot grow and become without this outer step of compassion. What have I done to perpetuate this issue? How can I do it different next time? What is in my own story that causes me to repeat behavior that I truly no longer want to continue? Oh, there it is again…what just happened to trigger this? Why did I interpret their behavior this way? What else might it mean? What if it isn’t even about me? In my opinion and experience, this is when it gets juicy. Like a sociological, Anthropological adventure into our own psyche and soul through our history. How do we get here? Without step 1, step 2, step 3, how do we know what we’re doing? And that is my question. I know my own journey has been of hiding, secrets, extreme self doubt, self-negation, allowing others to diminish me with their words and assumptions. My greatest change came when I asked myself this question, “How did X know to do what they did to me?” My inner response was crystal clear: They wouldn’t have unless it was being done to them, or someone was brutally wounding them. Compassion crept in and I could no longer see my story from a singular viewpoint. I believe without exception that bullies and abusers were themselves bullied and abused by people who were bullied and abused. Some are just mean and hurtful. Some are criminal. Some are criminally insane. Once I unlocked this truth, even though I didn’t have specifics, I could let them go. I forgave the person, while retaining the important knowledge that what they had done was wrong and I did not deserve it. It was a quantum leap in my healing. The next quantum leap in my healing was when I spoke the story out loud. Did I say this was a 33 year journey? Yep. And I have no embarrassment that it has taken into my mature adult years to be free of it. Free as in I am not defined by this past, and defining my own future once I took myself back and claimed authority of my story. Compassion and Self Critique = Life. That is what I know today. In the end…..
We arrive for conversation and reflection. We’re pretty sure that X is the topic and the sharing begins. But beneath the safe public topic on the surface, roils the real, the raw, the unready. So scary to let loose our real feelings and name our flaws, tiredness, and maybe the biggest scariest secret….how we think we really could do this incredible thing. In the studio here, we get to claim it all. You get to claim you. And you better. In a world where competition is the norm, and we weigh losers against winners, we can be led to believe that we have to be first, best, A+, exceptional. But the truth is, we cannot do it all. We can’t. A great old quote is attributed to Thomas Edison when asked why he had so many assistants. Edison suggested that if he could do it all, he would. But he couldn’t, so…assistants. I love the model of any person, event, idea, task being a hologram. I bring the view from my side, you bring the view from your side, she brings the view from up top, he brings the view from the opposite side, and they bring the view from inside. Together we see a greater hologram, bigger image, a more refined possibility. This idea that no one person can do it all is behind the best of a country when acting with integrity. It is what makes an organization run best. It is where invention takes off. It is how housework gets done and playtime for all is celebrated. I can’t do it all. You can’t do it all. It is imperative that you know who you are for real. It is imperative that they/she/he knows the truth of self. Only in this way can we get it created. Whatever “it” is. My sister is amazing. She runs a piano studio and a daycare. On any given day, she has infants, non-verbal toddlers, and preschoolers. They all get crayons and cardboard scraps. They all imagine and create. Everyone is doing so at their skill level, at their imagination level. At their own level. And all are celebrated. There isn’t a sense that the little ones have to wait 3 years before their scribbles look like dogs. Doesn’t matter. It takes them all to create art that day. (So many days I wish I was a preschooler at my sister’s daycare). We don’t get participation ribbons if we don’t participate. What we offer and contribute adds to truth, like spicy ginger in the cake. It makes it better. Know yourself. And if you don’t, then get yourself in to see me so we can begin. I was a sophomore in high school, two weeks in. As a freshman I took Algebra I. I worked hard hard hard to get a C. While my friends all finished the homework in class and got to goof around, I worked hard at the teachers desk. For a C. By the end of the year I felt like I had made progress so I signed up for Algebra II in the fall. Two weeks in. For two weeks homework problems were done on the board. I never got called up. Until I did. I went up front with about 4 other classmates and wrote out the problem assigned to me on the chalk board. I wrote the problem on the chalkboard. And then I just stood there waiting for a hole to open up beneath me. I was gaining strength to just sit down and when it came my turn I would simply say I don’t know. Sheila was next to me at the board. She leaned over and whispered the answer, so I wrote it down and sat down. My back was to the class the whole time, and the teacher had a little glass middle room between his classroom and another classroom. I just took the position that nobody had been paying attention. Mr. D. came up to the front of the classroom and went through all the questions. When he got to mine, he simply talked through the problem and the answer. He didn’t single me out, he didn’t call on me. After class I went straight to the guidance counselor and said that I needed to drop Algebra II. Her response? “That is fine. I didn’t know why you were taking it in the first place. Let’s choose another class.” We did. Sheila and Mr. D. will forever be saints to me. Sheila saved me, then never said anything about it ever again. Mr. D. surely had been watching, and created a learning environment that worked better by just working the problem on the board. What I find curious is that no one, no adult guide, had suggested to me that I should not take Algebra II. No blame here. But curiosity. I think that we are hesitant to speak truth to one another. My own sense of Can Do was overplayed when I didn’t fail Algebra I. I didn’t have a good sense of perspective or what to do. But had I not been part of the class for those two weeks, I would have missed a great moment of grace that has been with me my whole life. You know what I say now to my clients? I’ll say, “I understand that choice. What is your long game, and what are alternatives to get there? I will support you in whatever decision you make.” I will, you know. We don’t know the best choices in life, often until we are walking that path. Then it comes clear that course correction needs to take place, or that we are up for it when we were unsure. But what we must have is people who support our process. Even if they think another way might be better. No “I told you so’s” need to be spoken when it goes awry. We just keep carrying on. Guidance is a precious thing. Sheila’s actions were precious. Mr. D.’s professionalism makes me cry with gratitude. Oh, that word. Hapax. How I love it. It was the name of my spiritual direction practice when I first began in 2012. Hapax Spiritual Direction. I learned of this word and concept in a doctoral course on the Song of Songs in the Old Testament. Hapax Legomina means Once Spoken. When biblical scholars are doing translation from the original languages, part of the process is taking a word in a particular context of scripture, and seeing all of the places in the scriptural narrative where it shows up. All of the places where a word is used helps to form an understanding of meaning and definition. It gives clues as to what is really going on. For example, if a word is used in the book of Ruth for a situation that Ruth is in, and the only other places that same word is used in the Old Testament is to describe action by YHWH, then we see that the story of Ruth is a story of God. Like that. Cool. So along comes the Hapax Legomina. Once Spoken. It is a word that shows up once. Maybe twice. There are no other scriptural contexts in which to understand the word. Which means that it can mean anything. interpreters then assign a meaning and definition. But in actuality it is the poetics of reader and text that bring sacred possibility to understanding. I love this. So, I named my first journey as a spiritual director Hapax. Because I fundamentally believe that we are each Once Spoken. I know with my deepest knowing that there are no two people alike. You are unique in this world. You are a unique creation. I honor this so highly that my mission and vocation in life is to create space so that YOU can discover you. Discover that uniqueness. From that self discovery, we create our lives through choice. What is the opposite of our ability to create our lives through choice? Consumerism. Trends. Pinterest self development. Like looking at a bulletin board of other people’s ideas of who you should be, based on what everyone else is doing, and the outliers that then become the new trend. It is ok to go with a trend. It can be fun and refreshing to reframe our self knowing to bring about new self discovery. But we get to be the one who chooses this path. We choose from a place of alignment with our own spaces of soul, core, essence, truth. You are Once Spoken. You are known by the cosmos as an important and vital part of an extravagant picture that isn’t complete until you are you. Until I am me. Until each one of us are who we were created to be from the timeless Holy of Holies. You are everything, part of everything, and this is truth.